As a global traveller, when I reach a destination that ignites my happiness, a rush of inner peace sweeps over me. Such a place is the top of Victoria Falls on the Zambia-Zimbabwe border in Africa. 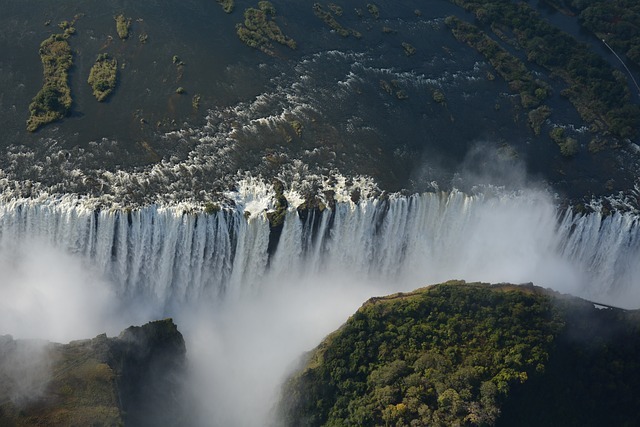 In the dry season, you can literally stand on the edge and watch water from the Zambezi River fall over a 355-foot (108 meter) drop. Locals call this spectacular location, Mosi-oa-Tunya, the smoke that thunders. The sound you hear does seem to be thunder. Roaring, splashing, flying thunder. From your spot of seasonally uncovered dry land you can look down over the edge of the falls into the plunging pools of water below. When you descend over the edge, the roar and rush of the water chases you in its continuous descent. If the soaking does not wake you up, the power of the drop should. But more than the immediate sound of the water is the overwhelming sense of peace you feel when you stand on the edge of a plunging waterfall, and experience excitement, not fear. If you automatically, spontaneously embrace where you are, without distraction and excuse, you may suddenly realize the feeling you experience is a connection to your own soul. At a spot like Victoria Falls when you find yourself closing your eyes to listen to the water, instead of activating your selfie-stick, your own state of well-being is in charge of your actions. You may not even notice when this happens. It could be when you are walking away from the scene and exclaim “I forgot to take pictures,” (and then quickly run back for more). Travel and surprise experiences provide you with the opportunity to grasp a singular time when you are drawn forward to appreciate contentment. You do not have to travel to Africa to capture this moment in your happiness. You can find this connection simply by understanding that you are entitled to have it. As you go through your own life and feel content to be helping a friend, or blessed to laugh with a child, when you, as the saying goes, ‘stop to smell the roses,’ you bring yourself back to you, every time. Happiness is a state most people have to consciously bring forward. Our society does not look kindly to the perpetually happy. If you were to go around proclaiming your constant contentment to all who would listen, people may soon become suspicious of you. They will want to know if you are up to something. But you can be happy if you so choose, if you remember that it is expected for your healthy life. 1. Recognize your right to be happy. Feel fabulous without feeling guilty. Our society focuses on the suffering and difficulties of life. You will attract words of sympathy and support for any particular difficult personal issue that you may wish to discuss, but you may not receive any applause for being continuously happy. You have to embrace the feeling for yourself. Happiness is a choice you can make for yourself by deciding how you want to live. 2. Set a cheerful outcome for your everyday life. As you go about your day to day, reset your mood. Maybe the traffic appears to move slower than normal, the kids are shouting louder than usual, the groceries and shopping need to be done, your tasks at work appear to be piling up – take a moment, at least one, to find the other side of the situation. The slow commute may mean you can listen longer to your favorite podcast. The shouting children may indicate they are communicating instead of staring at their smartphones. The waiting chores will give you a chance to get parts of the house in order. The tasks in the office showcase the demand for your skills. Find the other side as soon as you feel stressed out or slowed down, and turn those moments around to suit your purposes. 3. Hold the happiness mindset as your signature. Do you have one of those friends who people say is ‘always’ happy? Should that person be you? Even if everyone you know finds your insistence on being content to be annoying, hold on to your right to be happy. In a society embroiled in negative agendas, make yours the opposite. You may soon find that your insistence rubs off on many more people than it repels. You can ensure that being happy is built into your self development. Implement these three steps, and soon you may find that every moment becomes a moment of joy, and support for your inner peace. Next PostNext How Can Music Sustain Peacebuilding?